Shopping with Retravision means not only saving money, but saving time too! Let us save you the time and hassle of shopping around for the best price, because with Retravision you can always feel confident knowing you’re getting the best price guaranteed. Thanks to our 60-day Price Promise, if you purchase any Retravision product, and happen to find a lower advertised price from one of our competitors* within 60 days, we promise to refund 120% of the difference! Enjoy 60-day peace of mind with our 60-Day Price Promise! We don’t just offer the best price, we guarantee it! At Retravision, we’re not happy offering just an appliance price match. Instead, we offer all our customers a Lowest Price Guarantee*, which means if you can find a competitor's* lower advertised price on the same stocked item, we’ll beat it! And together with our interest free finance options on purchases over $1500, that dream designer kitchen or home theatre can finally become a reality! Looking for interest free appliances? You’ve come to the right place! Buy now, pay later with Retravision’s up to 50-months interest free finance options. Simply spend over $1500 in a single transaction and you could qualify for up to 50 months interest free! And you don’t even need a deposit! Plus, with a range of other finance options available, you could enjoy interest free periods of 3-months or more on purchases as low as $500. Our interest free financing is available on a large range of electrical goods and appliances, meaning you can get that new TV, desktop computer or oven you’ve always wanted, and pay absolutely no interest for the first 50 months. With Retravision, you can apply online now and get pre-approved or you can shop interest free online or in-store today! Leave the heavy lifting to us, and know that your appliances are in good hands with our easy, stress-free delivery and installation service. Don’t waste time and money hiring a truck or trailer, sit back and relax while the team at Retravision deliver your purchase right to your door. And with our easy, appliance installation service, you’ll start enjoying it sooner. Why pay the old way when you can zipPay to have it right now interest free! Create your account on your PC, tablet or smartphone and confirm your purchase then make your order - processed immediately. You can pay over time in flexible weekly, fortnightly or monthly payments. zipPay is speedy, secure and oh so simple. You can sign up to a zipPay account here and use it in-store - or shop online and choose zipPay as your payment option during checkout! Why shouldn't you enjoy all the electrical stuff you love? RetraRent is the smarter, more flexible, and more affordable way to shop in-store at Retravision. With RetraRent there's no upfront deposit, no application fees, and no accounting fees. Instead, you'll enjoy absolute peace of mind including stress-free after sales support. Now, that's a smarter way to shop! If one of our competitors* has a lower advertised price for an identical product, we'll beat it. 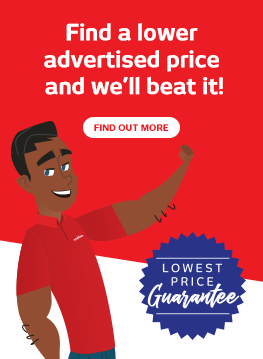 Simply show the advertisement in print or on your phone at any Retravision Store and if the price is current, and the item in stock, we'll beat their advertised price! Our Lowest Price Guarantee applies to personal shoppers only. The product must be in stock and available at one of our competitors listed below. The product must be new and factory sealed and of the identical brand, model, and colour. The competitor's price must be in Australian dollars and be inclusive of all taxes. The advertised price must be exclusive of all delivery and installation charges. We reserve the right to charge for delivery. This offer excludes orders paid via Interest Free Finance or ZipPay whereby the competitor is not offering the same payment method for the advertised item. This offer excludes items advertised by Retravision or a competitor as Clearance, VIP Exclusive, Factory Seconds or Scratch and Dent. Customer orders are accepted where payment is made in full for the product. We reserve the right to limit quantities sold. These terms and conditions are subject to change. You can apply for a 60-Day Price Promise either in the Retravision Store where you originally made your purchase or through Retravision Online. Our 60-Day Price Promise applies to personal shoppers only. The claim must be made within 60 days of the purchase date and supporting evidence of the Brand, Model, Price and Competitor advertisement must be provided. We will verify that the advertised price is current and that the product is in stock and available for immediate sale and delivery by the approved competitor. The product must be new and factory sealed and of the identical brand, model, and colour. The competitor's price must be in Australian dollars and be inclusive of all taxes. The comparable advertised price must be exclusive of all delivery and installation charges. We reserve the right to charge for delivery. There is a limit of one claim per product. Advertising errors, bonus offers, group buy offers, installations, clearance, ex demo and display products, promo code and finance offers, or cashbacks and discounts including where offered directly by a supplier or third party. Products advertised on deal, group buy, auction, buy it now or grey import sites. Third party suppliers under an agency agreement are excluded from our 60-Day Price Promise. These include but are not limited to: AEG, Asko, Falcon, Falmec, Miele, Neff, Speed Queen and Steel.